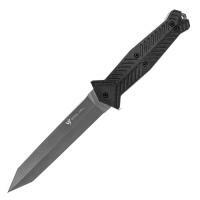 STEEL WILL 1000 Adept Plain Edge Fixed Blade Tactical Knife FREE SHIPPING! The “Adept” is a gladius for modern day Spartans. Possessing an extremely comfortable handle and remarkable symmetry, the “Adept” is equally comfortable for cutting and thrusting from any position. The “Adept” is a knife which simultaneously embodies the utilitarian practicality of a cutting edge product and the spirit of an ancient warrior’s weapon. Made in Italy. ©2002-2019 CopsPlus.com: STEEL WILL 1000 Adept Plain Edge Fixed Blade Tactical Knife FREE SHIPPING!